It seems there isn’t a week that goes by where some type of horrific school-related incident is in the news. This phenomenon isn’t linked to any country, but the unfortunate script usually includes someone – often a student – arriving on campus intent on doing harm to fellow classmates and faculty. While this represents the absolute worst-case scenario, there is also a less dramatic variety that has recently received a great deal of traction: bullying. A great deal of effort has been put into the elimination of student bullying. Much time has been spent on the best possible methods to reduce this phenomenon, and one tool that is gaining popularity is the usage of professional CCTV solutions. In South Africa’s Western Cape province lies the town of Strand. 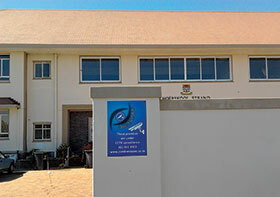 Known for its beautiful beaches, the town also has academic facilities, with one of these being Strand High School. • Make sure that school rules and regulations are adhered to. • Decrease occurrences of bullying. • Offer clear video surveillance of school entrances and exits. • Monitor any individual entering or leaving. • Offer clear video surveillance over athletic fields and general school grounds. In essence, administrators wanted a CCTV solution that would provide surveillance over access control and the school’s general grounds. To turn this idea into a reality, Hikvision’s official South African distributor, Sensor, and South African security installer, Cam Live Vision, combined to design and install a solution to address these goals. Bekker opted for a PTZ model to cover the school grounds (including playing fields, outdoor cafeteria, and parking garage), as well as school entrances and exits. Specifically, Hikvision’s Smart PTZ DS-2DF7284 Series 2 MP Network IR PTZ Dome Camera was chosen. With units placed on the front and back of the school building, PTZ functionality offers full 360-degree coverage. However, this PTZ functionality is only one piece of the puzzle. Another was a 20x optical zoom that provides the coverage needed. “It’s the DS-2DF7284’s 2 MP resolution that allows the school principal and vice principal to accurately identify an individual regardless if they are at the main front entrance or behind the rugby field,” explained Bekker. One additional bonus is this model’s Smart IR capability and 150 m of IR range, a tool “that is definitely of use during the night, to give us security even if students are not present,” Bekker added. Hikvision box cameras were chosen for indoor locations and specific outdoor areas. The DS-2CD864F-E(W) 1.3 MP Network Box Camera was combined with Hikvision’s TV0309D-MPIR lens to view the indoor school hallways, indoor cafeteria, and outdoor courtyard space. As this courtyard is largely covered, weatherproofing was not an issue. As with the previous speed dome, great megapixel resolution was also necessary. However, with the addition of the TV0309D-MPIR lens, spaces that experience inconsistent lighting are properly addressed. This is due to the lens’ varifocal IR function and auto iris – providing clear images in quickly changing lighting environments. Since Strand High School’s Principal and Vice-Principal use their PCs to monitor this IP solution, Hikvision’s iVMS Software was combined with the DS-9632NI-ST Embedded NVR. This NVR supports 32 IP camera channels and is an excellent tool to allow these administrators access to whichever camera that is currently needed. This comes in particularly handy during peak hours, such as the morning (with students arriving) and the afternoon (with them leaving for the day). And the results are already in: after only one week of using this solution, instances of bullying decreased. Bekker noted this was confirmed by both students and the principal. Importantly, everyone entering and exiting school premises is closely monitored – bringing Strand High School both security and a sense of confidence during these changing modern times.